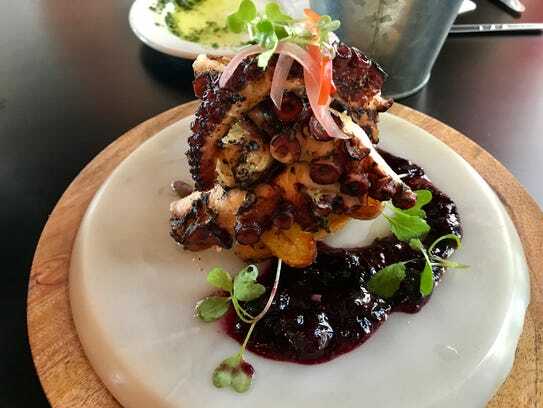 Smoked grilled octopus, Taverna Wood Fire Kitchen: I dream of this dish. And I’m not even an octopus fanatic. Taverna has a way of defying expectations and this $12.99 appetizer defied all of mine. It was presented under a glass dome foggy with smoke. The server lifted the dome at the table, unveiling the most buttery-perfect octopus I’ve ever tasted. A base of fingerling potatoes made for an earthy foundation, while sprigs of microgreens, wisps of pickled onions and a just-barely sweet blueberry compote added brightness and range. This is the type of mastery you don’t expect from a young, little-known chef in a low building on a Cape Coral side street. But at Taverna, expectations are meant to be defied.